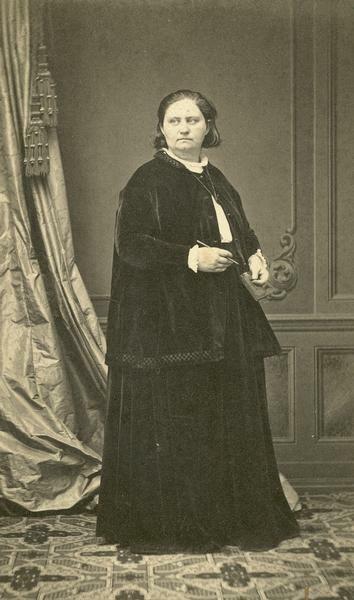 Mathilde Franziska Giesler Anneke was an internationally known educator, women’s rights advocate, journalist and publisher, poet, author, and arts critic who immigrated to Milwaukee in 1850. Over her life in the city she became involved in major liberal political battles of her day, and in her later years she ran a renowned women’s school in the city. Born on April 3, 1817 into wealth and status in Lerchenhausen, Westphalia (Germany), she received a largely private education and later moved within the heady liberal intellectual circles of mid-nineteenth century Europe. She formed deep political and emancipatory ideas through a combination of her personal struggle for child custody rights during a divorce from her first husband and contemporary European revolutionary ideas. In 1847 she married Fritz Anneke; during the 1848 revolutionary uprisings the couple were active publishers and served in battle. Like many other “freethinkers,” they immigrated to the United States; they travelled in 1849 from France through New York and then onto southeastern Wisconsin where extended family were living. By the time she arrived in Milwaukee, Anneke was already influential in German and international women’s suffrage and legal reform through her roles as a newspaper journalist, dramatist, and author. After settling in Milwaukee, she lectured and began publication of the suffrage newspaper Deutsche Frauen-Zeitung in March 1852. Its production may be the first time that women were employed as typesetters. Due to opposition from organized male printers, she ceased local publication after six issues. Anneke relocated twice from Milwaukee during her lifetime: first to the East Coast, where she continued to publish Frauen-Zeitung for a few years during the 1850s; and again during the American Civil War, when she moved to Zurich, Switzerland with Mary Booth and took up writing to support the anti slavery cause of the North, while husband Fritz served in the Union Army. Upon her return to Milwaukee from Switzerland at the end of the Civil War, she opened a school for girls with Cecilia Kapp: the Maedchen-Erzehungs Anstalt von Cecilie Kapp, later renamed the Milwaukee Toechter-Institut. Classes were conducted in German, without exams or report cards, and according to Froebel’s methods. Anneke taught mythology, German, literature, geography, geology, writing, reading, and esthetics. In spite of its popularity and renown, she and the school were in constant financial difficulties. She ran the school for approximately 18 years, to the end of her life. She was a recognized leader in local and American women’s rights issues, particularly suffrage. In addition to work within publishing and education, she represented Wisconsin at the National Woman Suffrage Association’s founding in 1869. She organized the first local convention in Milwaukee’s City Hall that same year, inviting Susan B. Anthony and Elizabeth Cady Stanton, and helped to found the Wisconsin Woman Suffrage Association. She remained active in this leading state organization through later life. At age 67, she died at her home on Cambridge Avenue on November 25, 1884. She is buried at Forest Home Cemetery. ^ Henriette M. Heinzen and Hertha Anneke Sanne biography, 1940, pp. 3-4, box 8, folder 1, Fritz and Mathilde Anneke Papers, Wisconsin Historical Society. Anneke’s father was a counselor of the king’s domains, enabling the family to live in the castle of Blenakenstein. ^ Heinzen and Anneke Sanne biography, 6, 8. ^ Heinzen and Anneke Sanne biography, 7. ^ Heinzen and Anneke Sanne biography, 9 and numerous sources including Diane Long Hoeveler, ed., Milwaukee Women Yesterday (Milwaukee: University of Wisconsin, 1979), 15, and Lillian Krueger, “Madame Mathilda Franziska Anneke: An Early Wisconsin Journalist,” Wisconsin Magazine of History XXI , no. 2 (1937): 160. ^ Heinzen and Anneke Sanne biography, 2, 4 and 27. At one point, Mathilde Franziska described Milwaukee as “the most important city in the West.” Anneke had extended family in Cedarburg and in Milwaukee. ^ See Genevieve G. McBride, On Wisconsin Women (Madison, WI: University of Wisconsin Press, 1993), 16, and McBride, ed., Women’s Wisconsin: From Native Matriarchies to the New Millennium (Madison, WI: Wisconsin Historical Society, 2005), 121. ^ Krueger, “Madame Mathilda,” 164n18. The women included Anneke’s daughter. ^ Heinzen and Anneke Sanne biography, 29; McBride, On Wisconsin Women, 16; McBride, ed., Women’s Wisconsin, 109. Krueger, “Madame Mathilda,”directly connects the events to the printers’ starting the city’s first labor union, 164 and 166. ^ Heinzen and Anneke Sanne biography, 30-31. ^ Heinzen and Anneke Sanne biography, 53, 57. ^ Heinzen and Anneke Sanne biography, 175. The first class had 16 pupils. Though widely understood to be a girls’ school, an article containing pupil reminisces notes that occasionally boys were pupils too; see Irene Norman, “National Honor Sought for Madame Anneke; Older Residents Recall Fight for Women’s Rights,” Milwaukee Sentinel, April 27, 1930. ^ Heinzen and Anneke Sanne biography, 185-186, 195. ^ Norman, “National Honor Sought for Madame Anneke,” 6a. John B. Gregory’s History of Milwaukee, Wisconsin (Chicago, IL: S.J. Clarke Publishing Co, 1931), 1181 gives possibly incorrect dates of 1866 to 1887 for the dates of the school’s existence: Anneke died in 1884, and other sources state the school opened in 1865. ^ Heinzen and Anneke Sanne biography, 217. ^ Heinzen and Anneke Sanne biography, 268-271. ^ Norman, “National Honor Sought for Madame Anneke,” 2; “Historical People,” Forest Home Cemetery, accessed June 23, 2015. Bank, Michaela. “Mathilda Franziske Anneke: Powerful Translator.” Chapter 2 in Women of Two Countries German-American Women, Women’s Rights, and Nativism, 1848-1890, 68-110. New York, NY: Berghahn Books, 2012. Brancaforte, Charlotte L. Mathilde Franziska Anneke: An Essay on Her Life. s.l. : Charlotte L. Brancaforte and Joan Robertson, 1998. Bus, Annette P. “Mathilde Anneke and the Suffrage Movement.” In The German Forty-Eighters in the United States, edited by Charlotte Brancaforte, 79-92. New York, NY: Peter Lang, 1989. Heinzen, Henriette M., and Hertha Anneke Sanne biography. Fritz and Mathilde Anneke Papers. Wisconsin Historical Society, Madison, WI. Krueger, Lillian. “Madame Mathilde Franziska Anneke: An Early Wisconsin Journalist.” Wisconsin Magazine of History 21, no. 2 (1937): 160-67. Mueller, Theodore. “Mathilde Franziska Anneke—Reformer, Suffragette, Author.” Historical Messenger of the Milwaukee County Historical Society 23 (1967): 125-30. Piepke, Susan L. Mathilde Franziska Anneke (1817-1884): The Works and Life of a German-American Activist, Including English Translations of “Woman in Conflict with Society” and “Broken Chains.” New York, NY: Peter Lang, 2006. Wagner, Maria, ed. Mathilde Franziska Anneke in Selbstzeugnissen und Dokumenten. Frankfurt: Fischer, 1980. In the late 20th and 21st century, scholars and the public, particularly in Germany, have rediscovered Mathilde Anneke’s life and work. Despite spending half her life in the United States, her writings are almost exclusively in German. Some of that oeuvre has been translated into English and several recent scholarly treatments of her life and work have been published. See the bibliography below. There is likely more to be learned. The Anneke Papers, available through the Wisconsin Historical Society, have correspondence, a biography, and texts. The German language media also are promising sites for further study. Bank, Michaela. “Mathilda Franziske Anneke: Powerful Translator.” Chapter 2 in Women of Two Countries German-American Women, Women’s Rights, and Nativism, 1848-1890 (New York: Berghahn Books, 2012), 68-110. Bus, Annette P. “Mathilde Anneke and the Suffrage Movement.” In The German Forty-Eighters in the United States, edited by Charlotte Brancaforte, 79-92. New York: Peter Lang, 1989. Heinzen, Henriette M., and Hertha Anneke Sanne, 2 volume biographical sketch. Fritz and Mathilde Anneke Papers. Wisconsin Historical Society, Madison, WI. Krueger, Lillian. “Madame Mathilde Franziska Anneke: An Early Wisconsin Journalist.” Wisconsin Magazine of History 21 (2) (1937): 160-67. Norman, Irene. “National Honor Sought for Madame Anneke; Older Residents Recall Fight for Women’s Rights.” Milwaukee Sentinel, April 27, 1930. ^ See, for example, the listed bibliography and , Mathilde Franziska Anneke, Germany Info website, accessed September 1, 2016, which includes a short biography and images of a 1988 Republic of Germany stamp in her honor. ^ Fritz Anneke and Mathilde Franziska Anneke Papers, 1791-1884, Wis Mss LW; Micro 951, Wisconsin Historical Society, Library Archives Division, Madison, WI.